Thousands of organizations, both large and small, have sold our all Wisconsin-made fundraising products and have earned great results! Contact us today! Profitable – Easily earn 40% or more profit. No Risk – Order only what your customers have purchased with no up-front costs. Customer Service – Helping you every step of the way to get the most out of your sale. Discuss your group's goals and we will answer any questions. 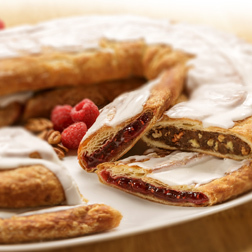 Choose to sell Kringles only or mix and match our full line of Wisconsin-made products. Your organization will have everything they need to sell our products, provided at no additional cost. Tally your sales, submit your order, and choose your delivery date. Deliver your delicious Wisconsin treats to eagerly awaiting customers! We offer an extensive line of the finest products ALL proudly made in Wisconsin. Our offerings give you and your group a wide variety of options to appeal to every customer. 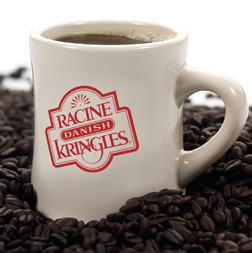 Choose to do a Kringle only sale, or mix and match with our full product line! 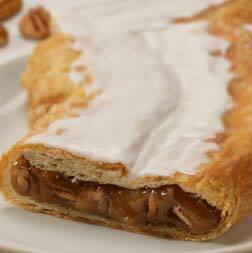 Kringles have become so popular, it's now the Official State Pastry of Wisconsin! Your customers can choose from 12 of our most popular flavors in a delectable 22oz. pastry including Almond, Pecan, and Raspberry–as well as some flavors unique to our fundraising program. 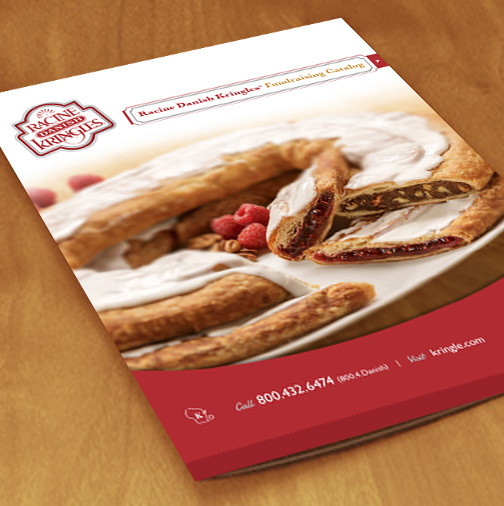 Shaped in the traditional oval and topped with a sweet vanilla or chocolate icing, our Kringles are sure to sway the most particular customer! We've partnered with Stone Creek Coffee Roasters in Milwaukee, WI. for the perfect complement to our Kringles. The 8oz. Gourmet Roast Coffee is selected from only the finest beans and roasted right in the heart of Milwaukee. House Blend – Well-crafted combination of cocoa, caramel, and lemon accented by an explosion of citric brightness in every great tasing cup. Breakfast Blend – Chocolaty sweetness and fruity flavor perfect to enjoy in the morning. It has hints of cocoa, cashew, cherry and lemon. Simply delicious! Breakfast Blend (Decaf) – Notes of chocolate, cherry, and caramel. The roast level of this coffee is just enough to make it accessible to anyone-it's not too dark, and it's not too light. Dark Roast – Smoky richness paired with notes of dark chocolate and walnut for its signature taste. It's suprisingly smooth! When you think Wisconsin, you have to think Cheese! 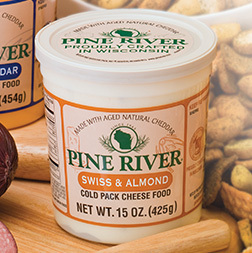 Pine River's award-winning cold pack cheese is rich tasting and buttery smooth. Wisconsin State Brand natural cheese, aged nine months, is blended with herbs, spices and other dairy ingredients to create popular flavors in 15 or 16oz. tubs. Sharp Cheddar – A Classic! Gold Medal winner in the World Championship Cheese Contest. Creamy golden Wisconsin Cheddar cold pack is buttery smooth. Swiss & Almond – Winner of the United States Championship Cheese Contest Gold Medal and World Championship Cheese Contest Silver Medal. Sliced almonds highlight the delicious flavor of Swiss cheese. Port Wine – Winner of the Wisconsin Governor's Sweepstakes Blue Ribbon. Fruity port wine flavors golden Wisconsin Cheddar. Aged Asiago – 2015 U.S. Championship Cheese Contest winner! Rich tasting and buttery smooth asiago cheese. Spread on crackers, breads or veggies. Smokey Bacon-2017 United States Championship Cheese Contest 3rd Place Winner! This hearty Cheddar cheese spread has a delicious, hickory-smoked bacon flavor. Chunky Bleu-2nd Place winner at the 2017 United States Championship Cheese Contest, Best of Class in the 2014 World Championship Cheese Contest and 1st Place at the 2014 American Cheese Society Competition! Our classic blend with a bold Bleu flavor and chunks of Bleu Marble Jack, make this Cold Pack truly one of a kind. The name says it all – a Wisconsin specialty. The old-fashioned smoking process, over slowly smoldering hardwood slabs and sawdust, ensures that that enticing natural smoke flavor. Usinger's® makes their 12oz. sausages in time-honored traditional ways. Beef Summer Sausage - This traditional, Old World summer sausage is only made with lean, choice, coarsely ground beef and seasoned “just right." Slowly smoked over hardwood slabs in old-fashioned brick smokehouses for two days to bring out the robust flavor and an irresistible tantalizing aroma. 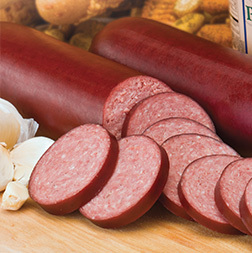 Beef Summer Sausage with Garlic - Garlic is essential to this summer sausage. Farm-style summer sausage featuring lean beef coarsely ground, spiced to perfection. Crafted in the European tradition this semi-dried summer sausage is slowly smoked for days over hickory slabs. A home grown Wisconsin success story. One bite, and you'll know why! Classic gourmet pizzas arrive frozen and ready to bake. Choose from eight different 12" pizzas. Primo Thin Margherita - A crispy, ultra-thin crust topped with robust tomato sauce, garlicky mixture of tomatoes & basil, part-skim mozzarella, parmesan & romano cheeses. Primo Thin 5 Cheese-A crispy, ultra-thin crust topped iwth robust tomato sauce, part-skim mozzarella, white cheddar & provolone, parmesan & romano cheeses. 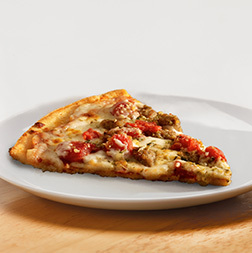 Primo Thin Italian Sausage - A crispy, ultra-thin crust topped with robust tomato sauce, Italian sausage, whole milk mozzarella, provolone, asiago, parmesan & romano cheeses, tomatoes, oregano & basil. Primo Thin Pepperoni-A crispy, ultra-thin crust topped with spicy tomato sauce, part-skim mozzarella cheese, sliced pepperoni, parmesan & romano cheeses. Original Breakfast Pizza - A rising crust topped with a cheddar cheese sauce, scrambled eggs, bacon & sausage. King Cheese Pepperoni - Enjoy this thin crust, topped with pepperoni and then smothered in a half pound of real Wisconsin Mozzarella cheese! King Cheese Combo -Enjoy this thin crust, topped with classic sausage and pepperoni and then smothered in a half pound of real Wisconsin Mozzarella cheese! King Cheese Supreme - Enjoy this thin crust, topped with pepperoni, red, yellow, and green peppers, black olives, onions and then smothered in a half pound of real Wisconsin Mozzarella cheese! 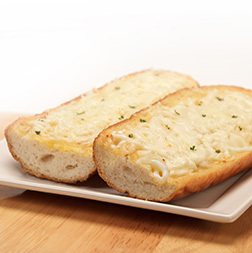 Joseph Campione 5-Cheese Garlic Bread is a great addition to any meal! First we bake fresh Italian loaves of bread, add a generous amount of butter and garlic, and then finish them off with a hearty helping of fresh mozzarella and herbs. People will come running when these are in the oven! Packaged two 6" loaves in one package. 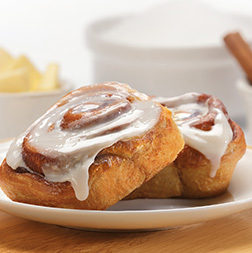 Make mornings something to look forward to with Aunt Marie's Cinnamon Rolls! Made from scratch, each package has four large, delicious rolls. Each bun has a rich, gooey center topped off by sweet vanilla icing - perfection! Baked from scratch, Aunt Marie's Brownies are probably the best brownies you'll ever eat. 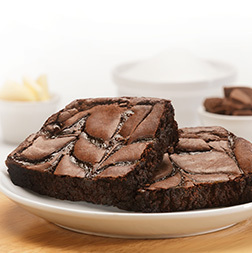 Classic chocolate brownie blended with a creamy caramel layer creates the ultimate chewy, fudgey temptation. 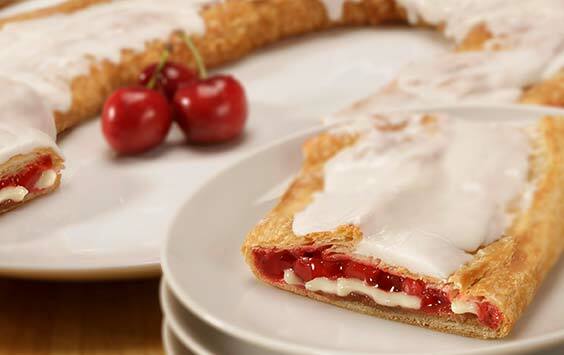 Just the right blend of cream cheese and all the right ingredients atop a sweet classic crust baked fresh. Available in six delicious 24oz. varieties. These come frozen and pre-sliced into 8 perfect portions so you can enjoy a special treat straight from your freezer, over and over again. 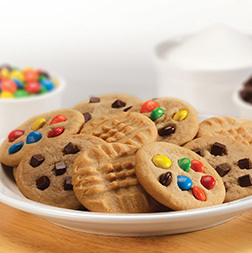 Our delicious cookie dough comes frozen in generous 3 lb tubs. Each tub will bake 48-1oz. cookies. 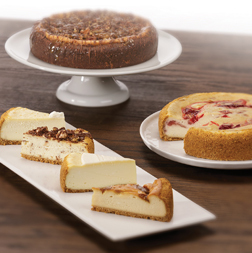 Choose any of our 7 homemade delicious flavors. Flavors include: Chocolate Chunk, Peanut Butter, Oatmeal Raisin, Heath®, Peanut Butter with Chocolate Chunks, Monster and M&M®. Can't decide which fundraising item is your favorite? Offer all of our delicious, Wisconsin-made treats and there's sure to be something for everyone. Does not include: Stone Creek Coffee, Pine River Cheese Spreads, and Usingers Famous Sausage. Still curious? Let us help!